Today is “Baba Marta Day”. In Bulgaria the 1st of March marks a holiday that welcomes the upcoming spring. “Baba Marta” translates to “Grandma March”, the mythical character who brings the end of the bitter cold winter! On this day people exchange “Martenitsi”. These are red and white coloured bands or figurines that symbolise health and happiness. The white initially represented human nature and strength, whilst the red showed health and the woman’s nature. 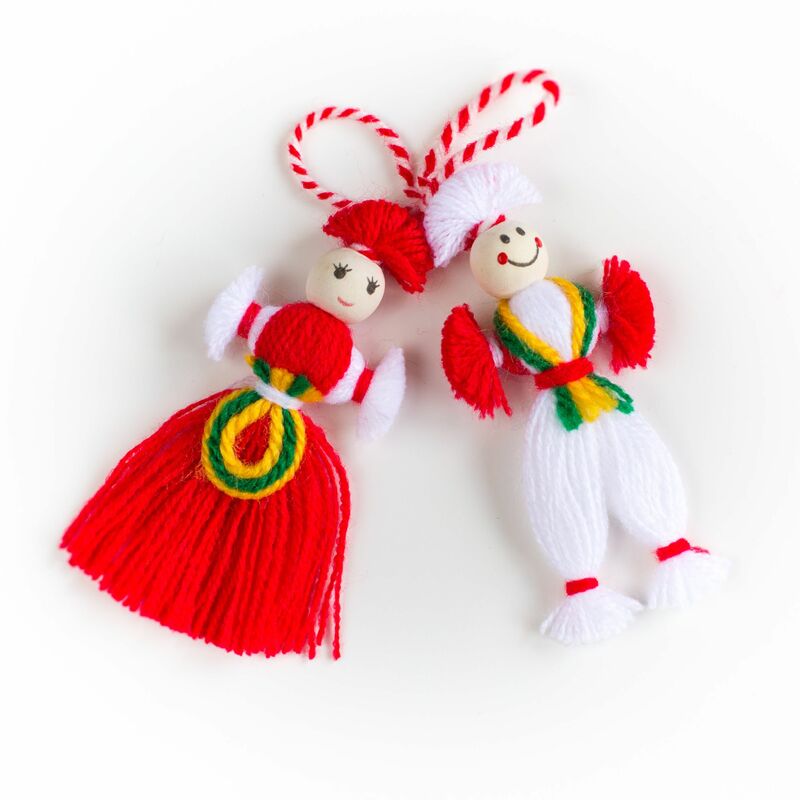 The most traditional martenitsa consists of two small dolls (male and female) and are called “Pizho and Penda” (Пижо и Пенда). Martenitsi come in many other shapes and sizes and people wear them as lucky charms. The tradition is to wear your martenitsa until you see some signs of spring: blossoming trees or birds like storks and swallows. 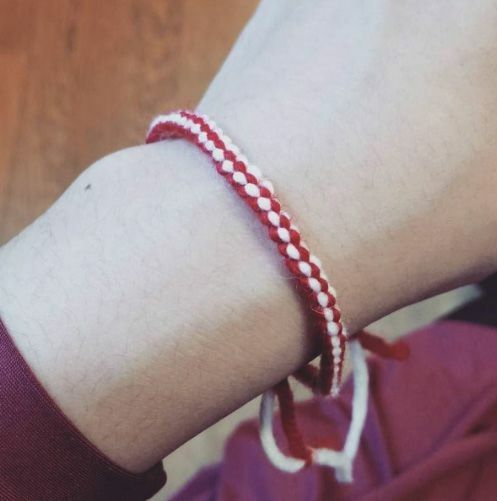 Some people then tie their martenitsa to a tree – so next time when walking through a park, if you see red and white yarn bracelets hanging on a branch, you know the mystery behind it! It was also believed that people placed them under a rock. They would then come back nine days later to see if there had been any ants; if there were the year would bring lots of sheep. Some people also chose to throw them into the river and let them flow away, representing the troubles of life leaving. Bonus fact: “Mărţişor” is a Romanian holiday that is similar to “Baba Marta”. It’s also believed in Romania that wearing the red and white bands leads to a prosperous and healthy year. The threads are hung somewhere outside the house like a gate to protect against evil spirits. Today the threads are still bought by people for their friends and family to show admiration. Jenny’s daughter Grace was a finalist in the 2015 Junior Language Challenge – and one of the stars of our video from the day! 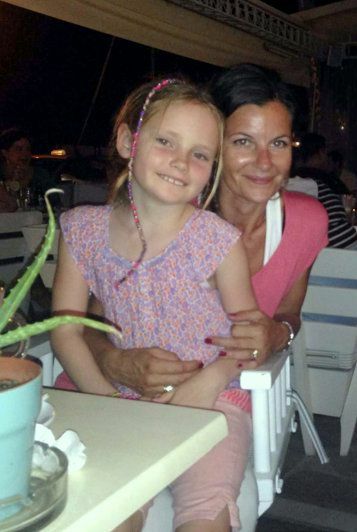 In today’s blog post, Jenny tells us about her experience of the competition as a mum, and what taking part in the JLC has meant to Grace. The JLC has become a very big part of our life since March 2014, when my daughter first entered the challenge. I was amazed by the commitment she put into the challenge, especially as she was only 7 at the time. She practised daily with her Daddy and it became a really fun part of the day. Even though she was ‘learning’, she didn’t/doesn’t class it in the same way as homework. Grace got through to the semi-finals in Cambridge. She was so very nervous and had no idea what to expect (similarly to myself!). She completed the first round and got through to the final 12. It was this round I sat in to watch, oh my goodness… It was nerve wrecking watching the scores go up and down. Unfortunately Grace didn’t make it through to the final that year. She wasn’t too downbeat about it and declared she would do better next time! I wasn’t sure my nerves could stand another one! March 2015 came and Grace started the challenge again. Proudly, she got through to the semi-finals and this time she came top in the final 12, so she was through to the Grand Final at Olympia! To us, this was an amazing achievement and we were so proud. On the day she made it through to the last round but only came 10th. Although, only 10th at the age of 8 from thousands of entrants is fairly epic for us all. The JLC team were fabulous throughout the trials, very reassuring and putting the children at ease. Grace is determined to make the top three in the finals this autumn! I cannot speak highly enough of the JLC and would thoroughly recommend all parents let their child experience this modern way of learning a language. It is a fun and challenging game with only positive results. So, as we commence the new challenge with Romanian, Grace reiterates her desire to make the Grand Final! Fingers crossed! Good luck to Grace and everyone who takes part in this year’s JLC, which will launch on March 11th and is open to children aged 10 and under across the UK. Entry costs just £5 and is donated to our charity onebillion. 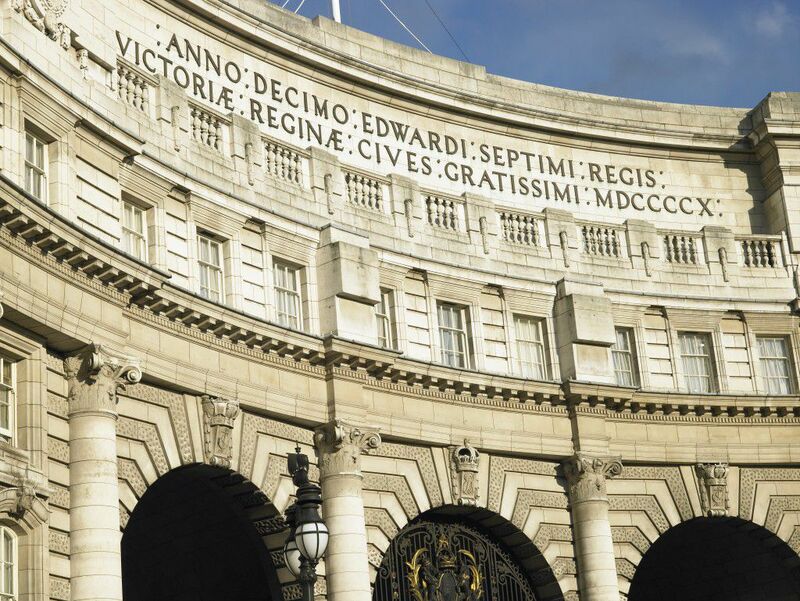 The first of our three languages this year will be Romanian! You can find out more about Junior Language Challenge 2016 on our official page: juniorlanguagechallenge.com. Or email jlc@eurotalk.com if you have any questions. Valentine’s Day is a moment we should all pause our busy lives to celebrate love and the important people in our lives with whom we share special moments – not only lovers but also friends or family. 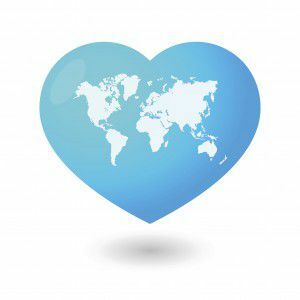 Obviously a popular holiday on the American continent, followed by Western Europe and in the last years Eastern Europe, the world’s interest towards the popular celebration of love has been rising. Although Valentine’s Day is internationally celebrated on 14th February, some cultures have their own version of it around the year. Romanians celebrate Dragobete on the 24th of February, a day that not only celebrates love but also the fact that spring is getting close. In old times it was an occasion for the young girls and boys to get together and play different games, dance and confess their love for each other. Brazilians celebrate Dia dos Namorados on 12th June, which is the day before Saint Anthony’s day (the marriage saint). One of the reasons Brazilians choose to celebrate love on this day is that traditional Valentine’s Day on February 14th would coincide with the Carnival celebration, which takes place in February and some of March. Dia dos Namorados is a day when people exchange little gifts, like sweets and flowers and lovers enjoy a romantic dinner or night out. The Chinese version of Valentine’s Day is celebrated on the seventh night of the seventh month (also called Double Seven festival) of the Chinese lunar calendar – that is sometime in August. Qi xi (pronounced chee – she) is nowadays celebrated similarly to other cultures by offering flowers and chocolates to the loved ones as well as couples spending a romantic day together. Japanese culture celebrates love on the same day as Valentine’s Day but instead of men offering gifts to women, it’s the other way around. Then one month later, on 14th March on White Day, it’s the men’s turn to reciprocate the gifts. The difference is that Valentine’s Day chocolates are a symbol of a man’s popularity, but the ones on White Day are only for couples or romantically involved people. Black Day (on April 14th) however is a day when the singles, or the people that haven’t received any gifts on any of the holidays, gather to “commiserate”, often wearing black, eating black coloured food and complaining about their love life. No matter how you choose to celebrate Valentine’s Day – or maybe you don’t celebrate at all – we believe love is a great feeling that we should hold onto every day and show our loved ones how much they mean to us. Download our app uTalk – Learn a Language to find out how to say “I love you” in 130 languages.